I’ve had this idea for a while now. 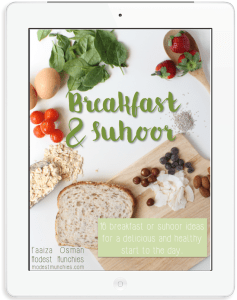 In fact I had planned to make this last year Ramadan, I just didn’t have the time last year. 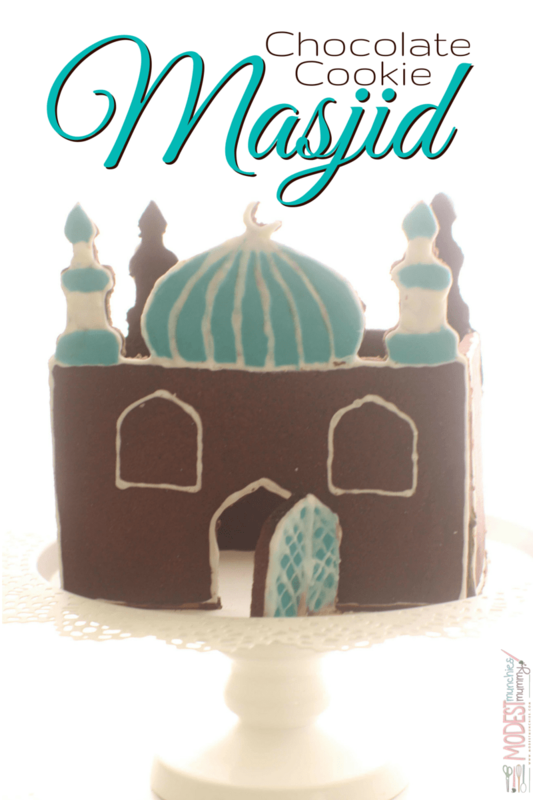 This is by no means a new idea (although at the time I thought it was) Lail from With a Spin has a little Gingerbread Masjid and I recently saw the cutest DIY kits by Secubit Bakery (USA) on Facebook. Seeing those kits was part of my motivation for finally getting this Masjid made, the other part was being asked by my friend Razeena over at Read Little Muslims. As you’ve probably noticed my version is made with chocolate cookies. Why chocolate cookie? Well, I’m not really a fan of gingerbread, plus gingerbread is synonymous with christmas so I thought it would be ideal to try something a little different and it’s chocolate, who doesn’t like chocolate? I didn’t want to reinvent the wheel when it came to the recipes for these, and it is tricky enough to get a cookie recipe that doesn’t flatten or spread so I’ve adapted recipes from other sources and I used pre mix Royal Icing from Queen to make the whole job a little easier. You could try chocolate for the sticking and decoration but I avoided that because 1. I didn’t have any, and 2. I wanted something that would set hard without me having to worry too much. However, I might try chocolate next time. I kept the template simple, a dome, minarats and square sides. 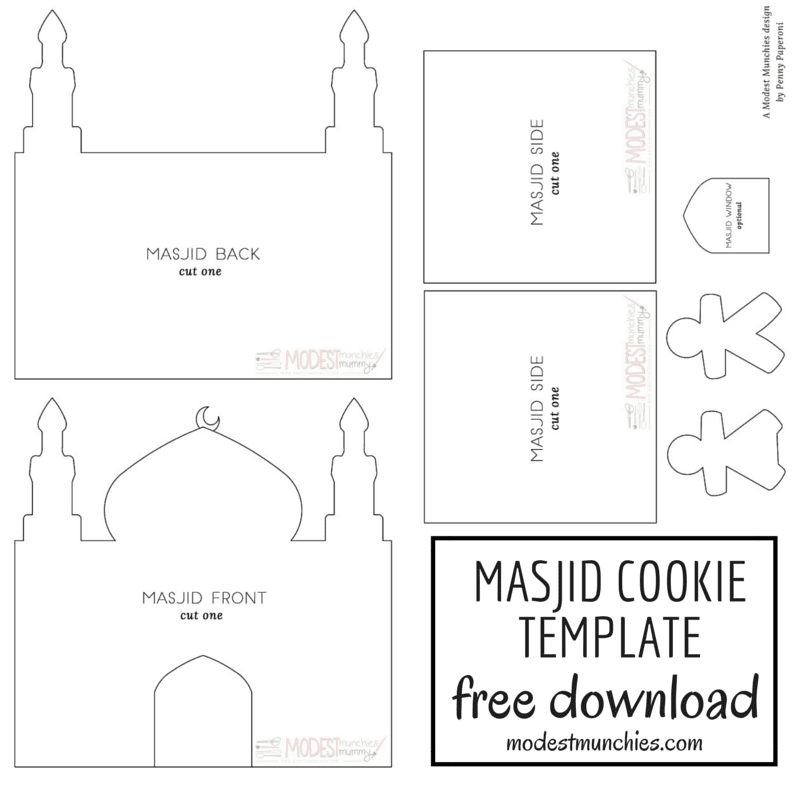 I left windows out of the masjid so it would be less hassle, but I’ve included it as an option in the templates so you can cut them out if you wish. I used the window template to add the windows in with icing afterward. I also included a people template, but you could use a gingerbread cutter instead. I haven’t included the people in our masjid as we haven’t had a chance to decorate them, I’m waiting to do them with my son, I know he’ll enjoy it. A BIG BIG thank you to Penny Paperoni for transforming my drawings into this awesome template for all of you. Click the image below to download and print your template. In a mixer, cream butter, sugar, eggs and vanilla essence until combined. Sift 3 cups flour and cocoa powder and add to the mixture. Mix until dough starts to form, if dough isn't forming add 1 tablespoon of flour at a time until dough forms. Place dough into a piece of cling wrap and place in the fridge for 1 hour. 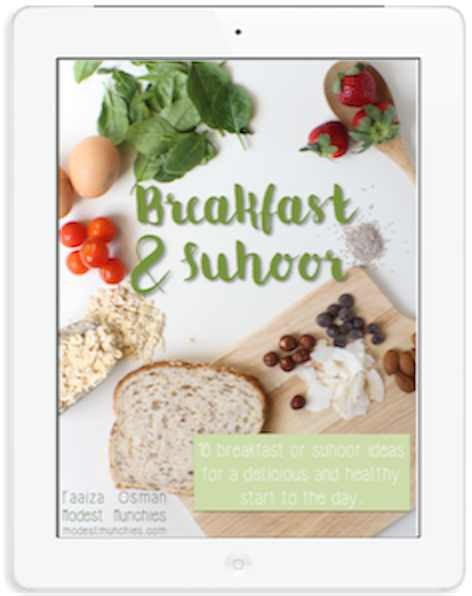 While the dough is chilling print and cutout your templates. Don't forget to cut out the door of the masjid. Cut baking paper pieces to fit your cookie trays. I used 2 cookie sheets (and reused 1 later on for the masjid people). After dough has chilled remove from fridge and split into 2 lots, place 1 lot back into the fridge. Roll the dough onto the cut piece of baking paper, I found this the easiest way to roll the dough, use flour if necessary. Roll the dough to ½cm thick. Place the templates (1 masjid/minaret piece with one square side fits well together on one sheet) onto the dough and cut it out as close to the edge with a sharp thin knife. Remove the excess dough by gently peeling it off the baking paper, being careful around the edges of the masjid cut outs. Place the excess dough in the fridge as well. Carefully lift the baking paper and place it onto the tray then place in the fridge to chill for another hour. Do the same with the other lot of dough, cutting out another square and another masjid/minaret side, place again in the fridge for an hour. If you have another tray roll out the excess dough on another sheet of baking paper and use the people template to cut out as many people as you like, you could also use a gingerbread cookie cutter. Pre heat oven to 175c after the cutouts have chilled for 45 minutes. Once heated, place the trays into the oven. The masjid and squares will take 13-17 minutes, keep an eye on it from the 10 minute mark. Your cookie will be done when the middle seems firm and is not wet looking. The people shapes will take from 5 - 8 minutes. I baked the people separately so they didn't burn. Measure out your half cup of royal icing mixture and place it into a bowl, add in water a few drops at a time. I used a syringe. It's easy to get the mixture too wet, so be sure not to add too much. You want your icing to be thick, a good guide is the 20 second rule. Run a spoon through the mix and count the time it takes for the streak to settle back, it should take at least 20 seconds. Tint your icing brown to match the cookies and fill into a piping/ziplock bag. Make another batch of royal icing as you did for the brown icing. This time colour it in various colours of your choice. Use candies, lollies, sprinkles and the like to decorate the sides of the masjid. Decorate each side of your masjid with the icing and decorations and let it set for a few hours. Get a large flat plate, board or cake platter. 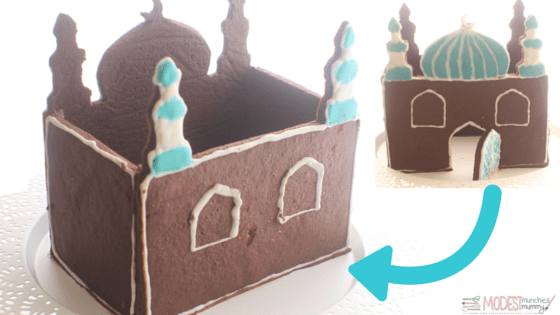 To attach the masjid front to the plate, pipe a thick line of brown icing onto the flat surface, remembering to leave a gap for the doorway (use the masjid template cut outs to guide your lines). Hold the masjid front piece onto the icing for 15-30 seconds and place a glass or something firm at the front and back of the piece. Do the sides next, by piping icing onto the inner side edge of the masjid front and pipe a 12cm line on the the plate. Hold the side in place for 15-30 seconds and place something on both sides of the piece to hold it in place. Repeat with the other side. Finally the masjid back, pipe a line between the 2 sides and along the inner edge of the piece, hold the back piece in place for 30 seconds and place something firm on either side to hold it in place. Pipe more brown icing into any gaps. Use glass cups to keep everything in place while setting. Set for a few hours. Once set, remove cups and clean out any access icing by gently cutting away with a sharp knife. Put on display or serve with tea! The assembled cookie will last 1-2 weeks in cool weather, be sure to keep it covered with cling film to avoid dust, dirt and pests getting into it. If baking to assemble at a later date, store your pieces in an air tight container in the freezer. When ready to decorate and assemble, remove all your pieces and let them thaw separately, then decorate, set and assemble. If baking and decorating to assemble at a later date. Decorate your pieces and let them set. Wrap each piece in cling film and freeze. Before thawing, remove each piece from the cling film and allow to thaw separately. Assemble and enjoy! Totally love this idea! and THANK YOU for actually thinking of something that’s a departure form the typical gingerbread! Ma sha Allah! What a great post! I’m totally going to give this a shot with the Grands! Thank you for sharing, Sis!